Getting injured in the opening quarter of the season opener was about the worst fate which could have befallen former McMaster Hec Crighton Trophy winner Jesse Lumsden. The Edmonton Eskimos tailback went down last night after injuring his surgically repaired shoulder on a hit from Winnipeg's Siddeeq Shabazz, who is lighter than him by 20 pounds. On TSN's panel, Matt Dunigan seemed kind of shaken, talking about how tough it was to see that happen to someone who has worked his rear end of come back from surgery and prove he can take the pounding in the CFL. Jock Climie, the former Queen's and Montreal Alouettes star, also showed sympathy while evoking the games-goes-on ethos of football, pointing out if you can't withstand a regular tackle, you should not be playing. David Naylor, globesports.com's football writer, was clear that this setback could short-circuit his career. "Lumsden has legions of supporters who will insist he's merely the victim of bad luck (including his former coach at both McMaster and Hamilton, Greg Marshall). But the evidence suggests otherwise. "Which is why when Lumsden became a free agent this off-season, there wasn't exactly a stampede to his door, despite his significant talent. CFL general managers and coaches simply didn't feel comfortable building their offence around a player they thought could not be counted upon to handle even 10-15 carries a game. And the fact that Lumsden doesn't play special teams made it even tougher to justify a large investment in him." There is a post up at Out of Left Field semi-jokingly likening Lumsden with former hockey star Eric Lindros, whose career was derailed by injuries. Not to make this sound like a funeral dirge, but it does put Lumsden's years at McMaster (2001-04), where he set CIS records playing for current Western Mustangs coach Greg Marshall, in a new light. He would have be an all-Canadian at any school in any conference in any era. One irony with Lumsden, though, is he has tried to make it as a Canadian playing an American position in a Canadian league, with a playing style which owed more to American football. It worked well at Mac from 2001-04. The teams he played on under Marshall at McMaster were perfectly suited to his style. 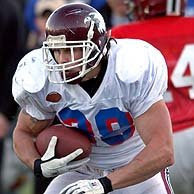 The Marauders, typical of most OUA teams in the '90s and early 2000s, played straightforward power football, using a tight end and a fullback on most plays. In Lumsden's senior year, 2004, Mac tried to shift to a more pass-first focus to give itself a better shot at reaching the Vanier Cup. Greg Marshall adapted well after coming back from the CFL. Last season, Western reached the Vanier Cup playing a pro-style offence with a 180-lb. scatback-type, Nathan Riva, playing tailback. I say all this as a way of reflecting on what contributed to the hype back in 2003 and '04. It was a trip to watch Jesse Lumsden try to defy the long odds of a Canadian becoming a feature back in the CFL. He was fun to watch. As for his injury history, an Out of Left Field user theorized that Lumsden "got used to running over smaller, weaker kids right up until the pros. He's kind of a taller, longer legged back to begin with, so that upright running style of his makes him a huge target. The only back I can ever remember getting away with that style was (former B.C. Lion) Sean Millington." One also cannot think of Lumsden without thinking of Toronto Argonauts running back Bryan Crawford. Crawford, a Hamiltonian, graduated from high school the same year as Lumsden and opted to go to Queen's. The Golden Gaels never beat McMaster, going 0-5 against them from 2001-04, including a two-point loss in '02 and three-point loss in '03. However, Crawford has found a home in the CFL as a fairly typical example of a Canadian running back. He has been a captain on special teams. In Toronto's season-opening win on Wednesday, Crawford got the occasional touch while lined up in two-back sets with Jamal Robertson, rushing four times for 20 yards and making a 25-yard catch-and-run play to set up an early touchdown. Crawford threw a block to spring Robertson for a 46-yard gain (which ended up being a 61-yard play thanks to a Tiger-Cats penalty). As Apu Naheesapeemapetilon once said, it might not be glamourous, but it's good honest work. Meantime, one hopes we have not seen the last of Lumsden. He was awful fun to watch and brought a lot of attention to Canadian Interuniversity Sport, for a time.